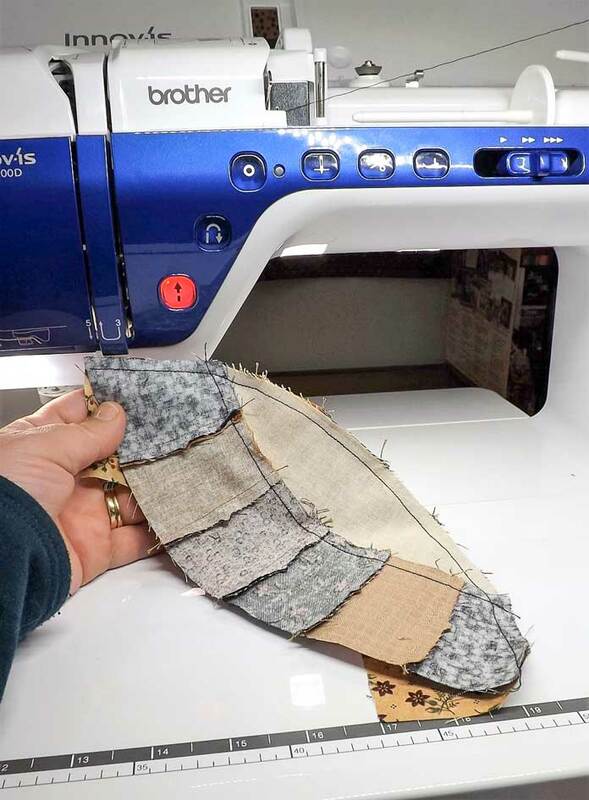 Yesterday I used the Dreamweaver XE to sew the first curved seams in the Double Wedding Ring quilt and we saw how easy curved piecing can really be! Today we’ll finish assembling these sections of our blocks by sewing on the remaining pieced arcs. 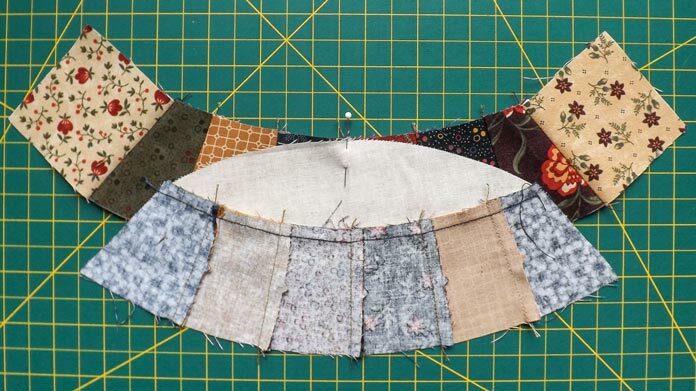 How’s your curved piecing coming along? 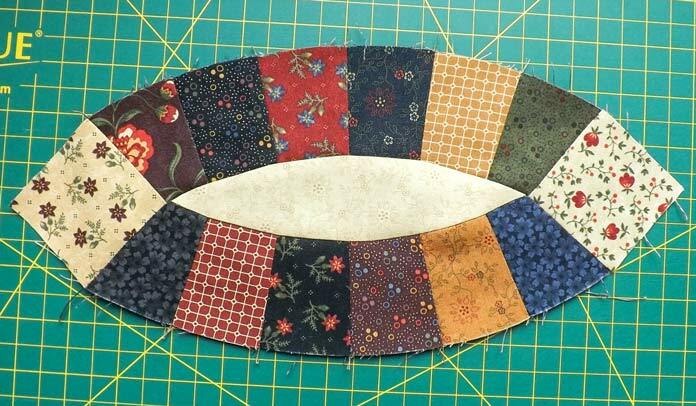 Take one of the sections pieced yesterday and fold it in half lengthwise to find the center. Place a pin along the fold. Pin center of inside arc. 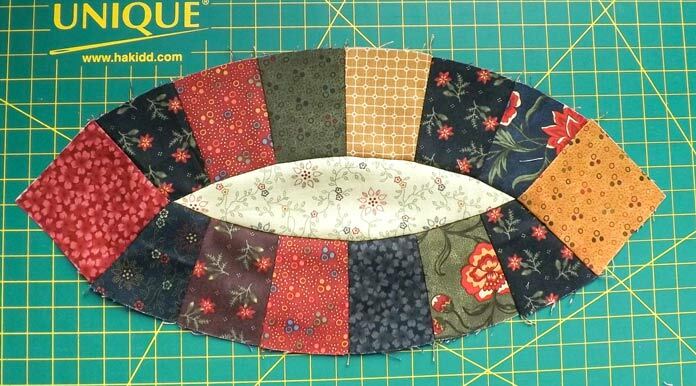 Match the center of the pieced arc with the pin at the center of the inside arc piece. Pin the two sections together at their center. 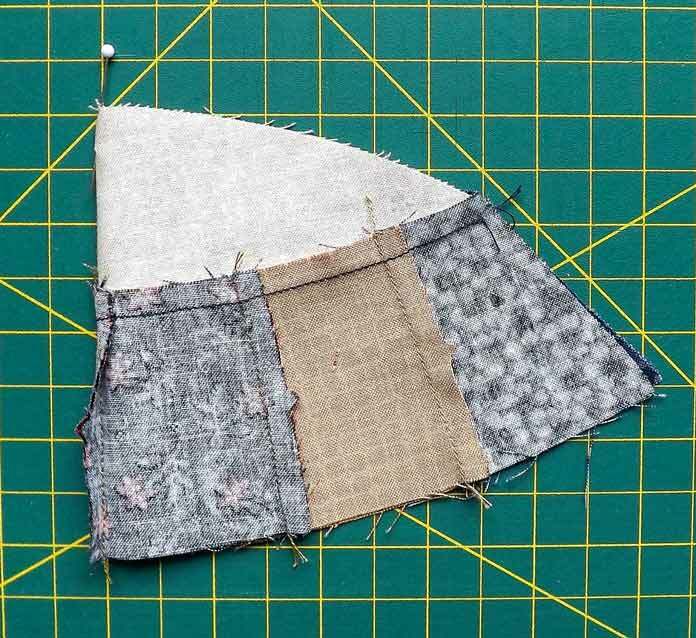 The seam where the end square meets the pieced arc, needs to be matched up correctly with the seam between the inside arc and the opposite pieced arc. Align these two seams so that they meet ¼” in from the raw edges (not right at the raw edge). You can see if they are matching by folding back the fabric on the top fabric to see ¼” in from the raw edge. Put a pin right in that spot on the top fabric and ensure that it comes out at the back right on the seam. This step is essential for making the point of the inside arc accurate. Match up the ends of the two sections and pin these as well. Five pins placed correctly is all you need! 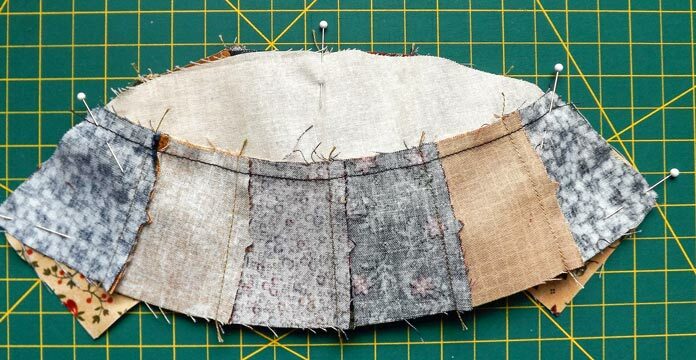 Follow the same process as yesterday to sew the curved seam using the Dreamweaver XE. 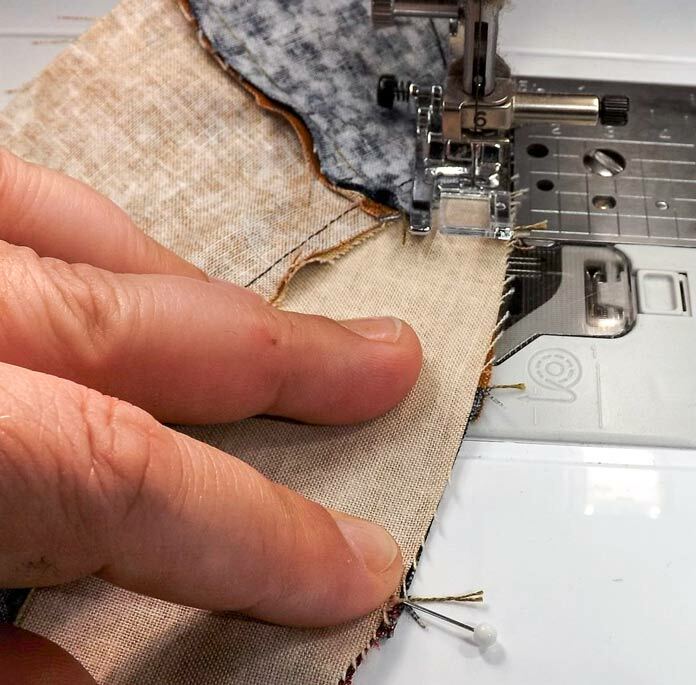 Use the needle down function and gently pull at the pin to stretch the seam straight for easy sewing. Here’s the second curved seam that completes one arc section of the Double Wedding Ring block. Press the seam as I showed you yesterday and your finished arc section should look like this. As you can see, this one has light colored squares at each end. Here’s one of the arc sections with a dark colored square at each end. Here’s a close up of the point of the inside arc. 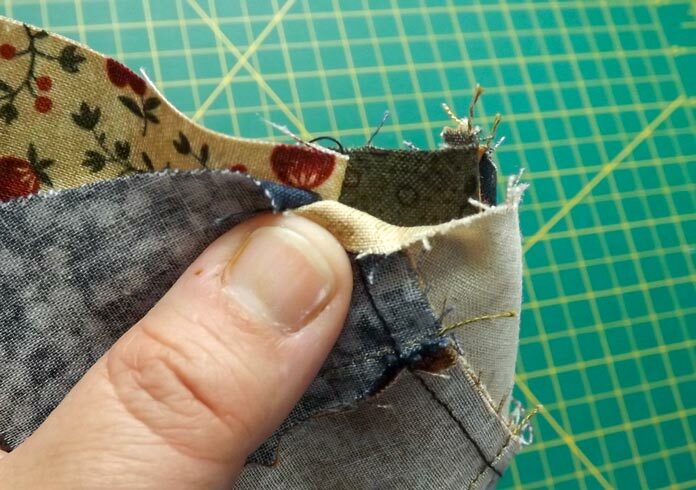 If your point doesn’t look like this, then you probably didn’t match the seams correctly (see above), pin the seam quite right, or you veered off course a bit while sewing and your seam at that point ended up being narrower or wider than ¼”. Have a close look at the seam to see what you need to fix for the next one you sew. How do I know how many dark arcs and light arcs to make? The dark ended arcs will be sewn to the top and bottom of the blocks and the light ended arcs will be sewn to the right and left sides of the blocks. 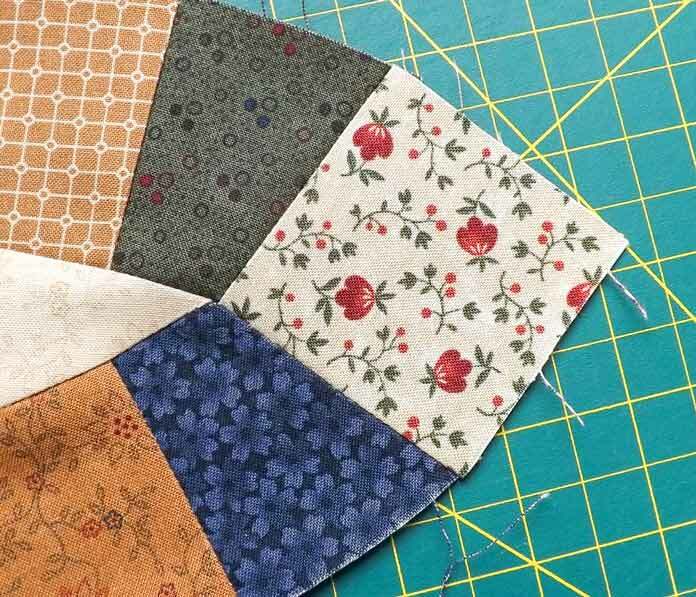 So if you have a square quilt, you’ll need an even number. 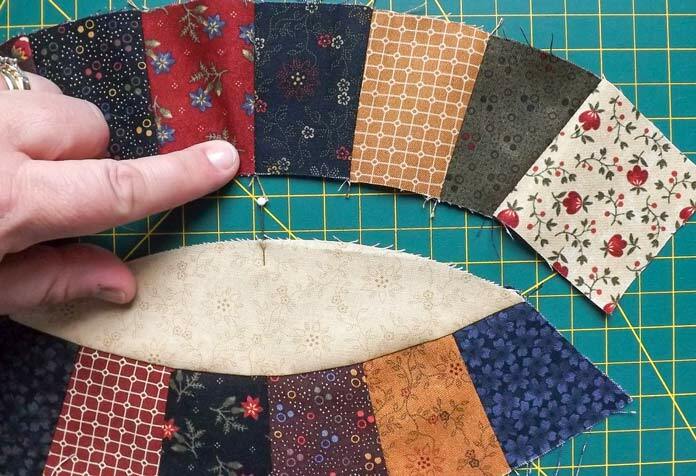 If you have a quilt that is one block longer than it is wide, then you’ll need one more dark ended arc than your light ended ones. For example, according to our chart, you need 127 arcs for a queen size quilt. Therefore you need 64 dark ended arcs and 63 light ended arcs. Believe me, this will all make way more sense when we start putting the quilt blocks together. 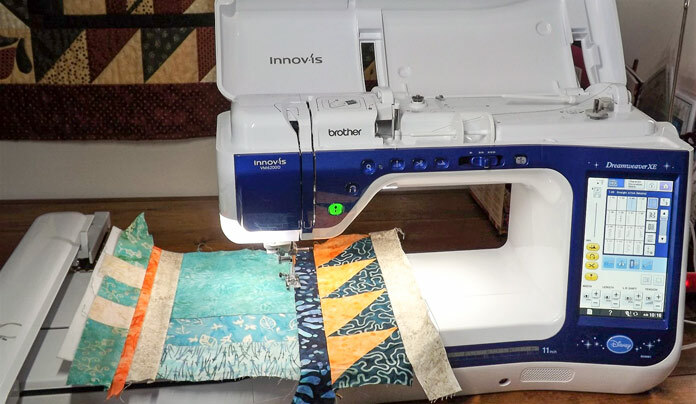 Unfortunately, we’ve run out of time for this week, so you’ve got 3 weeks to keep sewing those arcs together and in April we’ll start assembling the blocks and then the quilt top. Until then, happy sewing! I hope you’re using the Brother Dreamweaver XE, we can all use as much help as we can get!